New York prison escape: Plans in works for at least six months. 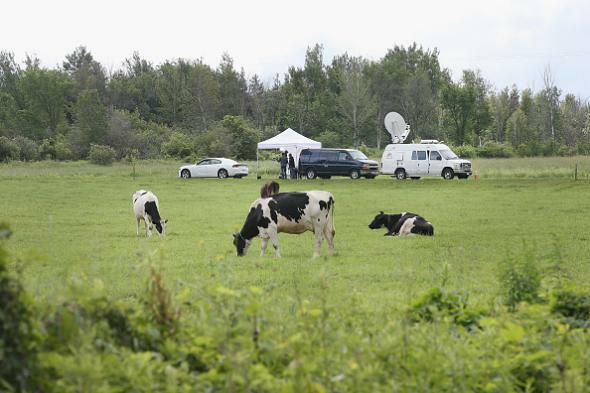 News crews and cows in the area near Constable, New York where escaped convict David Sweat was shot on Monday. A resident near the Clinton prison reported two men running through his yard shortly after midnight on June 6, the day Matt and Sweat went missing. Officers didn’t arrive at his house until 9 a.m. and didn’t bring scent-sniffing dogs to the scene until 3 p.m. The FBI is investigating Clinton Correctional employees’ potential involvement in a broader scheme of intra-prison drug trafficking. Twelve employees, including the prison’s superintendent (referred to as its warden in some reports), have been put on leave. Sweat says he split from Matt five days before Sweat was caught because Matt was slowing him down; Matt may have had severe blisters and food poisoning. Area district attorney Andrew Wylie says Matt and Sweat began sawing through the steel walls of their cells in January and, contrary to previous reports, did not use power tools to do so. Sweat made a “dry run” the night before the actual escape—during which he went as far as emerging from the manhole outside the prison that he would eventually use to actually leave the grounds—before returning to his cell. The owner of a hunting cabin that the pair seem to have broken into found that his bottle of “grape gin” had been opened and left out of place. Matt smelled like alcohol when he was killed Friday. Sweat’s medical condition has been upgraded from critical to fair.